“How much space do I need?” This question leads to decisions on where you want to live, what type of home fits you and how you remodel. The trick is to assess what you own and decide how you will store it for convenient access. Carefully consider this challenge because poorly organized spaces often become daily irritations, impeding the pleasure of being at home. 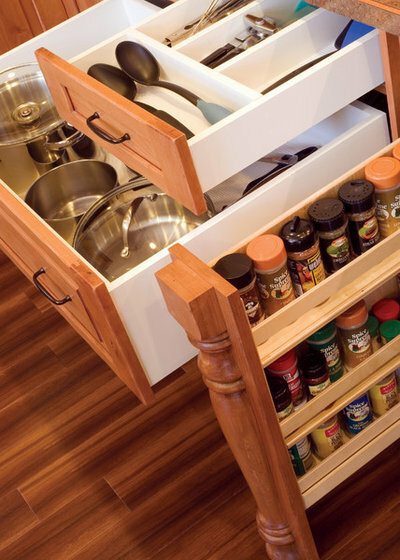 Kitchens top the list of rooms in which you need to get your storage right. 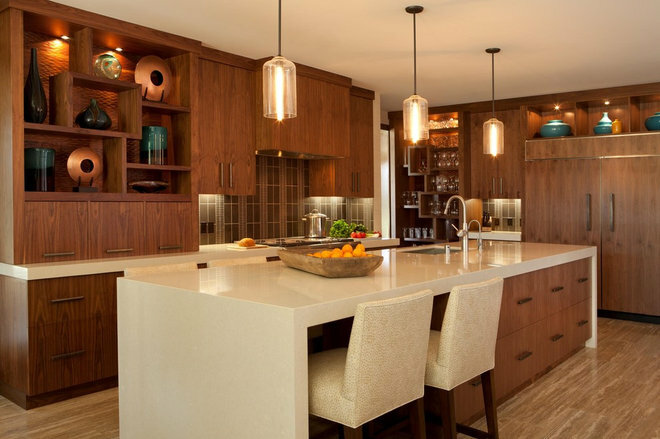 A contemporary high-end kitchen features open display storage. The kitchen deserves special attention because it is home to a long list of items, some of which cycle in and out of the house. Requirements vary widely, so kitchen organization principles, combined with your household type, are the common threads. Consider grouping your storage around three primary activity areas: the refrigerator, the sink and the range. 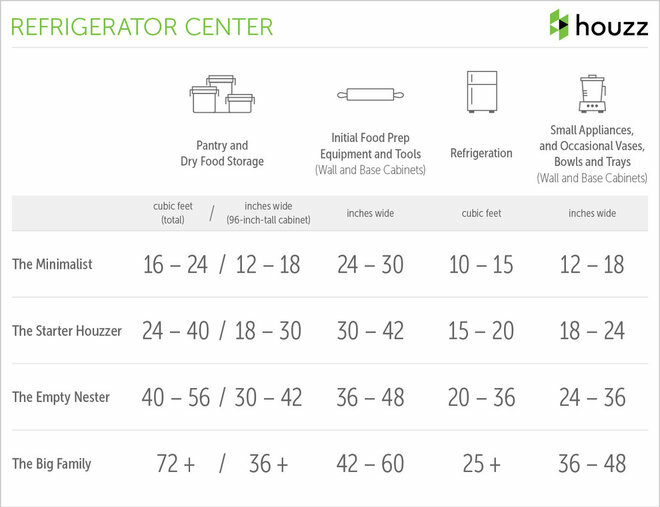 The refrigerator center serves as a receiving and initial food-preparation point in the kitchen layout. It is best positioned near the entrance from the direction of grocery arrival. Even if this arrangement is not the case in your kitchen, considering this function can help you determine how to begin organizing your space. A countertop next to or across from your refrigerator is the ideal spot for setting down grocery bags. This position allows immediate transfer of cold items to the fridge and freezer, and storage of staples, canned goods, condiments, cereal boxes and other dry food items in nearby cabinets or a nearby pantry. 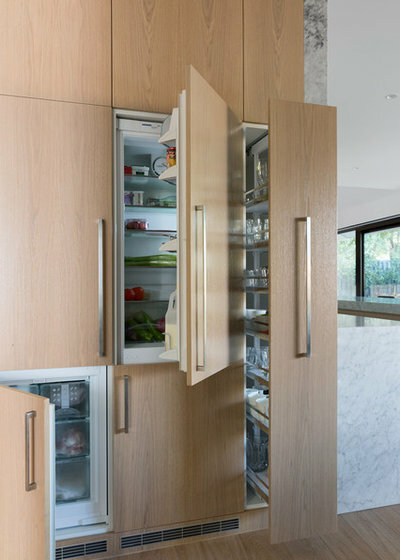 The refrigerator center is also the ideal spot for the can opener, food processor, coffee and bread makers, and other small appliances you use with dry goods. Appliance garages such as this one help eliminate countertop clutter near the refrigerator station. Cookbooks can be anywhere in the kitchen, but the refrigerator center is a good location since cookbooks are used in initial food prep. Place a small bookshelf in a place where it will remain dry but be within reach, as shown here. Consider placing brooms, dustpans and mops in a pantry or small closet near your refrigerator center. Pantry and dry food storage. Allow at least 16 cubic feet for storing dry groceries. Pantry pullout cabinets begin at about 24 cubic feet, while dedicated closet pantries begin at about 72 cubic feet (a space that’s 3 feet square by 8 feet tall).Initial food prep equipment and tools. Start with wall and base cabinets of at least 24 inches in width. Bigger families and collectors need to begin with at least 42 inches in width. Refrigeration. The smallest fridge starts at about 10 cubic feet of food storage space. Top-of-the-line units start at about 25 cubic feet of refrigerated food storage space. Small appliances, occasional vases, bowls and trays. Minimalists begin with 12 inches in width of wall and base cabinets, while big families may want to start with 36 inches. The sink center should be between the refrigerator and the range center, or cooking area, for maximum efficiency. Since sinks get the most use and traffic of any spot in the kitchen, centrally located sinks and dishwashers work best. Plan to have the most uncluttered countertop spacein the sink center. The area in and around sinks is used for food-preparation tasks involving cleaning and cutting, as well as washing and cleaning up after meals. Place trash and recycling containers strategically so that tidy disposal happens effortlessly. 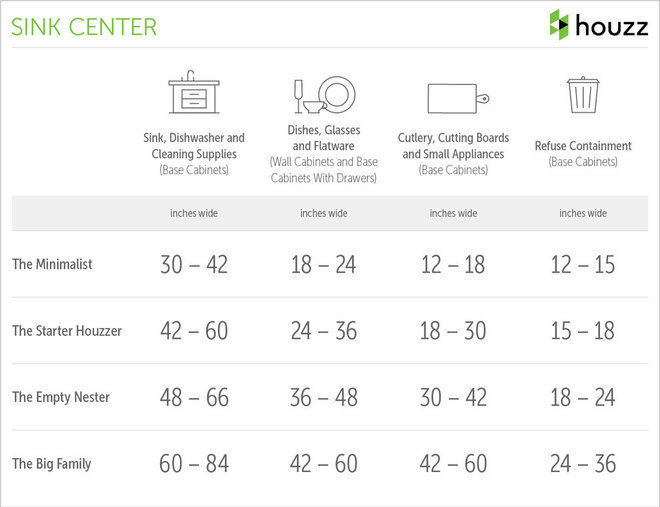 Storage at sink centers includes places for everyday flatware, dishes and glassware, as well as activities involving waste management, dishtowel placement and storage, cleaning supplies, polishing and drying. 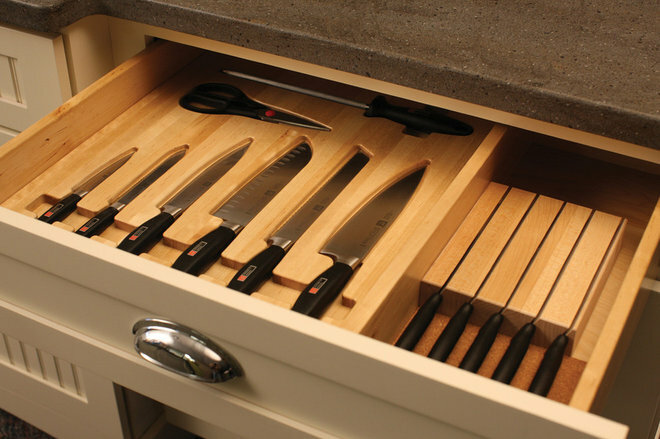 Place cutting boards and knives at a midpoint between the sink and refrigerator so you can easily access items from the refrigerator, cut and chop as necessary, and dispose of the remnants to the sink center, which holds the refuse containers. 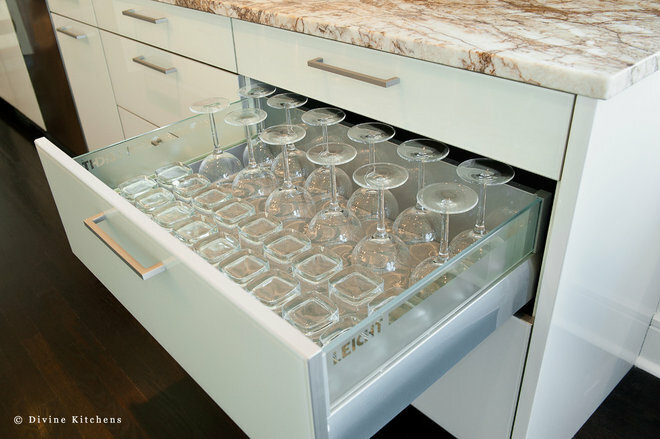 Most people store drinking glasses in wall cabinets near the sink and dishwasher, which works well, but drawers designed to hold glassware offer another solution and can make access more convenient. 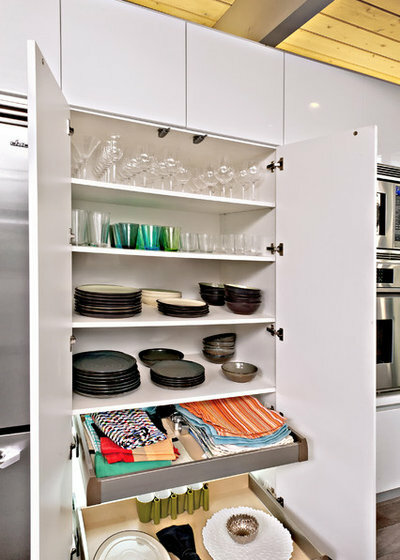 In any case, maintain a location convenient to the sink and dishwasher for your glassware and everyday dishes. 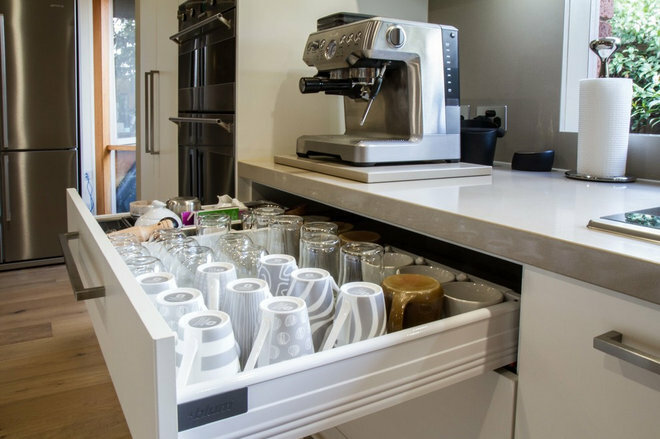 When organizing your kitchen, look for ways to store items related to each other, such as mugs near the coffee station, as shown here. Sink, dishwasher and cleaning supplies. Minimalists can find sinks as small as 12 inches in width and dishwashers at 18 inches in width. Big families may require two 24-inch-wide dishwashers and a 36-inch sink. Dishes, glasses and flatware. The smallest kitchen needs at least 18 inches in width of wall and base cabinets, while gourmet cooks and large families should begin with 42 inches in width of upper and lower cabinets. Cutlery, cutting boards and small appliances. Minimalists begin with 12 inches in width of wall and base cabinets, while big families should begin with 42 inches. Trash and recycling. Depending on how you recycle, compost and dispose, begin with 12 inches in width of base cabinets and go up to 36 inches in width for a big household. Two configurations, a range or a cooktop with wall ovens, comprise the range center, where cooking food and preparation for serving takes place. Place these functions toward or near the dining room. 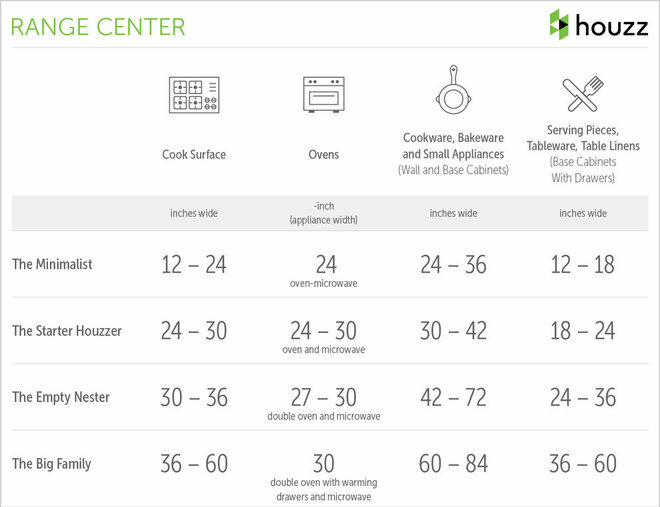 Anything that involves the cooking process needs to be within the range center. 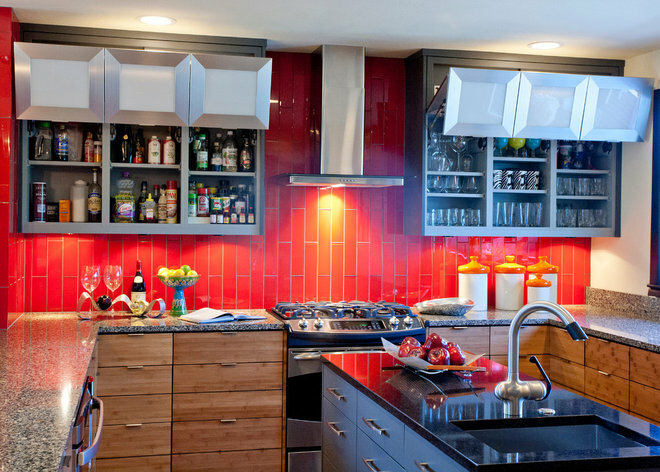 Ovens with ample countertop space next to or closely across from them provide a spot to set down hot items quickly. In immediate and obvious proximity to the range center, put potholders and other items that aid in handling hot cookware. Also use this location to transfer cooked food to serving dishes. Plan to store platters, bowls and other equipment used to get food to the table around the range center. 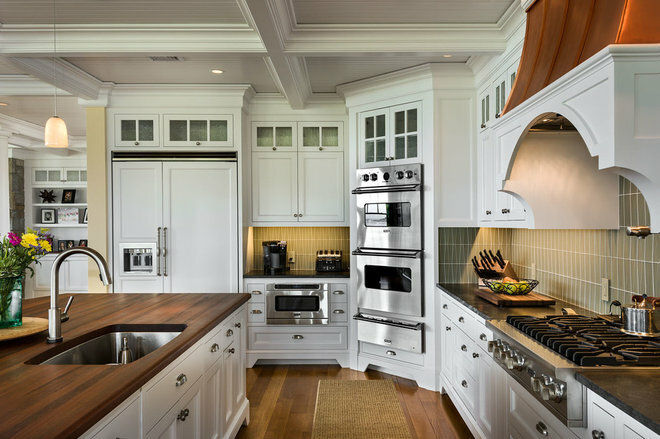 Consider dedicating a cabinet for cookware frequently used on the stovetop, and another cabinet with cookware more commonly used in the oven. 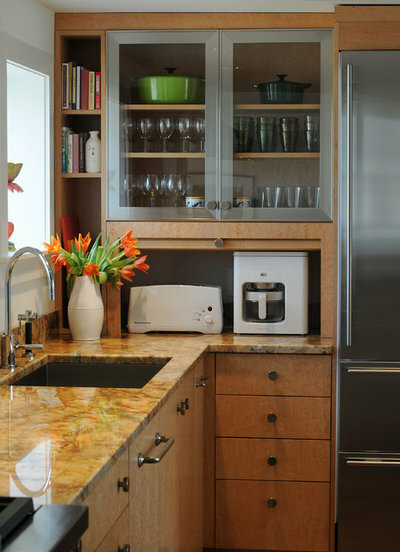 Place warming appliances in this area to allow convenient transfer of food to your serving dishes. Breadboards and bread bins work well in the range center. Small appliances that belong in the range zone include toasters, waffle irons, bread makers and portable grills. Spice storage, pots and pans, and cooking utensils placed immediately around cooking equipment ensure convenient and intuitive access to the tools and staples you need in meal preparation. Personal preference determines whether you want to place these items in upper shelves or cabinets, as in the previous photo, or in drawers and pullout cabinets that are below eye level, as shown here. Either can work, so decide what is best for you and conforms to your design aesthetic. Cooking surfaces. 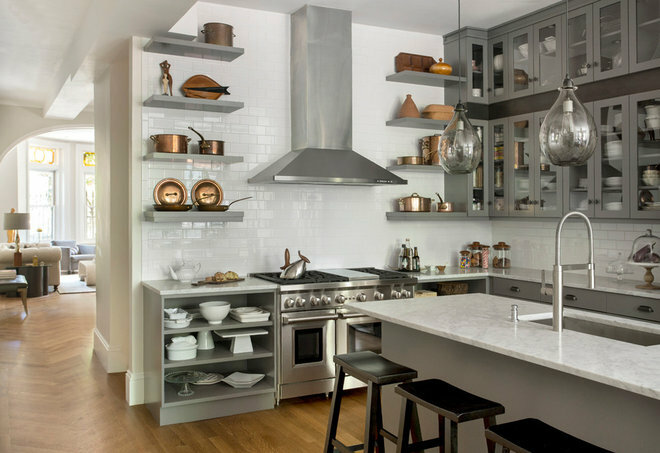 While a New York City apartment dweller may be able to get by with a tiny 12-inch-wide two-burner cooktop, big families will need at least 36-inch-wide ranges or cooktops, and some may go as wide as 60 inches. Microwaves. These ovens can be found in 24-inch widths for minimalists, while some units are built into double-oven arrangements that need 30 inches in width. Cookware, bakeware and small appliances. Small abodes need at least 24 inches in width of wall and base cabinets, while big families begin with at least 60 inches in width. Serving pieces, tableware and table linens. 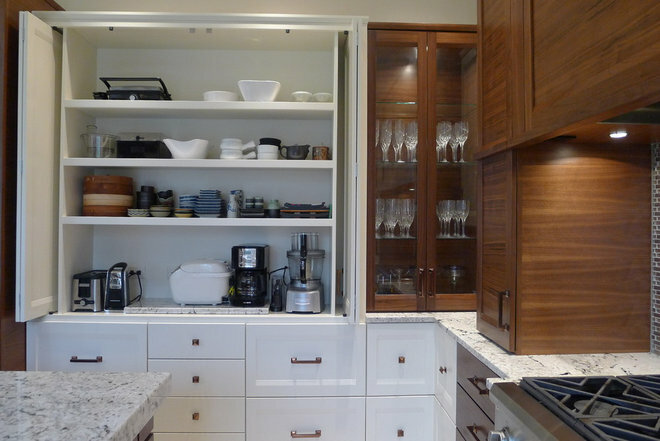 Minimalists need at least a 12-inch width in base cabinets, while a big household needs at least 36 inches in width. Consider the three-center concept flexible, and use it as a starting point to organize your kitchen depending on how you plan to use it. For example, you may want to have a spot in the kitchen for young children to safely contribute, or you may set up your space to suit multiple cooks. The key is to organize items so that they are placed in an obvious location and can be easily accessed for the coordinating activity. 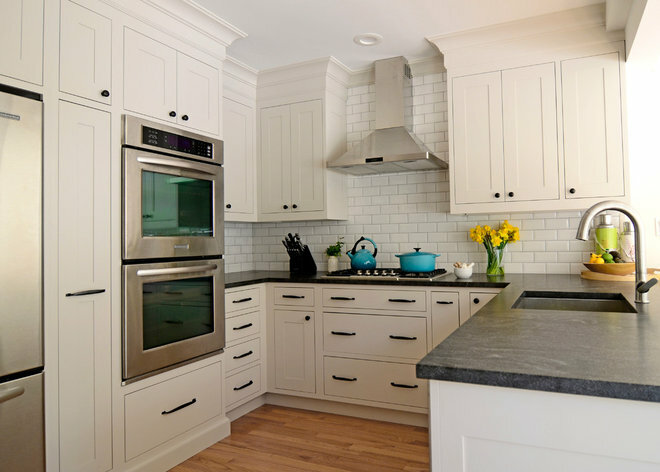 An efficient transitional-style kitchen has closed storage lining every wall. From left to right, the refrigerator begins this one-wall kitchen, followed by a pantry cabinet. Next, a dishwasher and small sink provide an efficient cleanup space, with open shelving for everyday dinner and glassware artistically displayed. A small cooktop and wall oven frame the right-hand end of the scheme. High ceilings allow an extra bank of cabinets above average reach, which can be accessed when necessary with a stepladder. 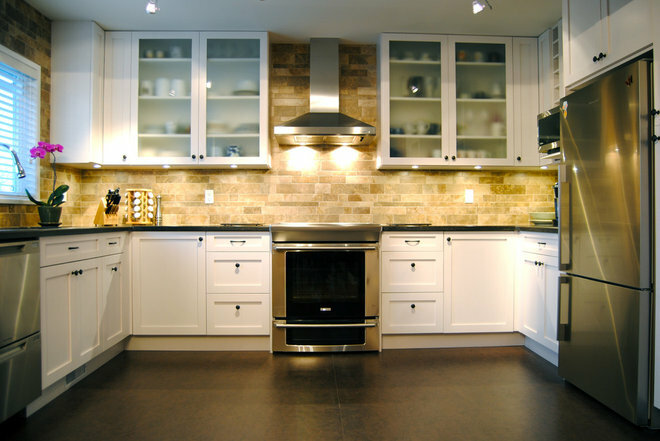 Efficient but thorough should be your thoughts when putting together a starter kitchen. This example has a simple 30-inch-wide range and a built-in microwave oven strategically placed next to the fridge. The U-shape provides an efficient work triangle but allows enough space for a couple of cooks to work together. In an urban neighborhood of Philadelphia, this kitchen provides plenty of glamour and upscale finishes for the empty nest of these owners. Spaces and features are generous but not oversized. This kitchen begins with a large built-in refrigerator with an ice and water dispenser. A microwave and coffee maker come next before transitioning to the cooking center, which hosts a double oven and warming drawer, and a large professional-grade cooktop to the far right. The sink and dishwasher in the island complete the work triangle positioned comfortably between the cooking and refrigerator centers. Should I Make a Lowball Offer on a Home?